Our summer observation period is off to a good start. 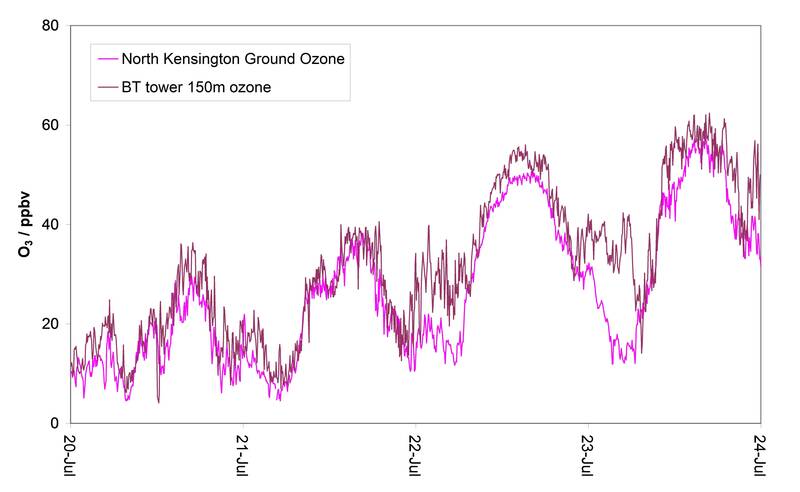 Clearflo measurements of ozone over the past few days measured at the BT Tower and North Kensington sites in London are showing some interesting features: The graph below shows ozone concentrations in parts per billion by volume (ppbv) at both sites. The ozone shows a clear diurnal cycle, increasing during daylight hours when it is created through photochemical reactions. The concentration at the background urban site North Kensington is lower than concentrations 150 m above on the BT Tower – this is particularly true at night, when concentrations drop at ground level, but remain high aloft. The reduction in concentrations at the ground is due to a mixture of chemical reactions with nitrogen Oxide, emitted predominantly by traffic, and deposition to the urban surface. Clearflo is studying not only ground level concentrations, but the vertical structure of the chemical species is also incredibly helpful in working out the processes controlling concentrations at the surface. The high ozone concentrations are accompanied by an urban heat island with London’s air temperatures being about 4 degrees Celsius warmer at night than in the rural locations as shown by the time series below. This second figure shows the predicted urban heat island (UHI) intensity from Met Office UKV forecasts for the night from 23rd to 24th July. 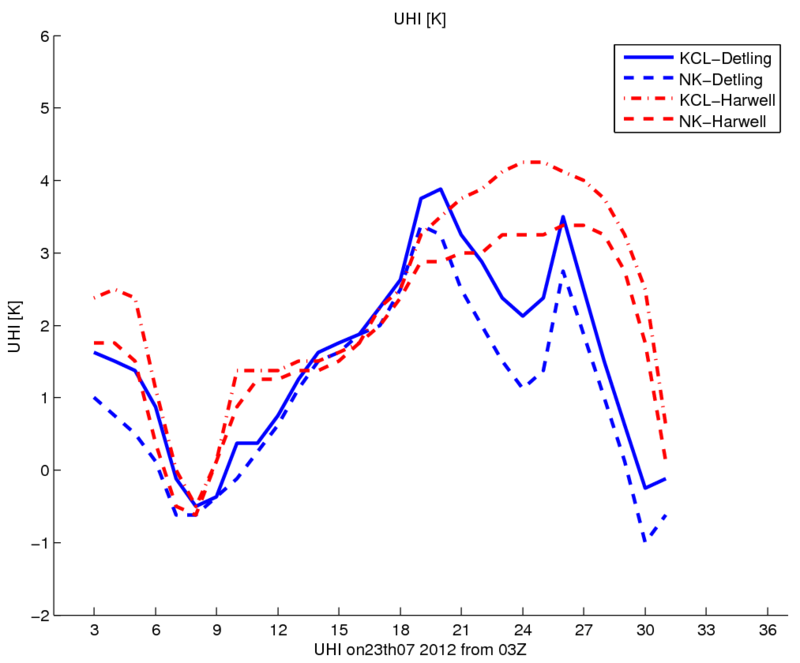 The UHI is calculated as the difference between predicted air temperature for North Kensington and Kings College London versus predictions for rural locations in Detling (east of London) and Harwell (west of London). The warmer night time temperatures in London are caused by the ability of urban areas to store more heat in the urban canopy during daytime that is then released into the air later at night, leading to warmer city temperatures. With more sunny weather forecast to occur over the next couple of days the pollution levels and city temperatures may rise further. Watch this space for more Clearflo observations this week. With special thanks to James Lee of the University of York, and Janet Barlow and Sylvia Bohnenstengel from the University of Reading for the data and information.